Eloy Elementary is a multicultural district serving approximately one thousand students. Our district has three neighborhood elementary schools in the heart of Eloy, Arizona. Eloy is midway between Phoenix and Tucson and provides a rural setting for life and learning. The schools in Eloy Elementary School district provide instruction in a core curriculum including reading, language arts, mathematics, science, and social studies. All students in our district receive free breakfast and free lunch. Eloy Elementary School District values dedication to our students and their families. Most of our certified staff has at least ten years of experience in the classroom. Our support staff is also highly experienced in assisting students in the learning process. Eloy Elementary in partnership with our parents and community is committed to offering ongoing academic excellence by engaging and encouraging our students to exceed standards while supporting all learning in order to develop and promote successful, productive citizens! Your children are our children, and together, we can prepare them for the future. Kindergarten through second grade students attend Curiel Primary School, 520.466.2120. EESD offers full-day kindergarten to all students. We also offer a pre-kinder program. EESD also offers tutoring and early risers programs to help students succeed. Curiel Primary received a 21st Century Grant to assist in providing enrichment and intervention programs for our students. Enrichment programs include newspaper, music, reader’s theater, dance, virtual field trips, and many others. Third through fifth grade students attend Eloy Intermediate School, 520.466.2130. Eloy Intermediate School has implemented Samsung smart technology in all of its classrooms. Eloy Intermediate students have the most integrated and innovative technology available to schools to assist in providing an education worthy of the 21st century. Eloy Intermediate School has been a model school for technology in the classroom. Eloy Junior High School, 520.466.2140, is home to the sixth through eighth grade students of EESD. 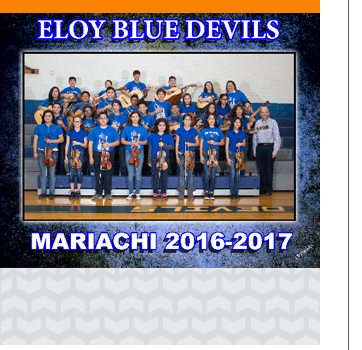 Our Blue Devils have an outstanding athletic program and several enrichment classes including band, mariachi band, student council, and yearbook. After school activities such as athletics and National Junior Honor Society provide a wide range of experiences and opportunities for EJHS students. EJHS received a 21st Century Grant to assist in providing enrichment and intervention programs to promote students achievement. Some of the enrichment programs at EJHS include STEM robotics, writer club, STEM nutrition, gamers club, arts and crafts, mariachi, D-Back science, drama and dance, and photography. In addition to these enrichment programs, we provide intervention programs to assist students in meeting the goals and requirements for promotion to high school.